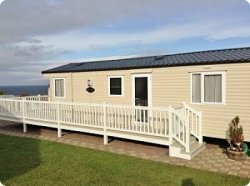 Platinum 3 bedroom caravan with full wrap around veranda with sea views overlooking Arran and Ayrshire coast. Rattan furniture also. 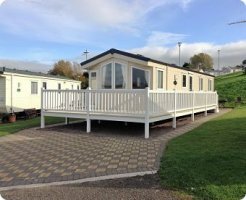 Fully Double Glazed, With Gas Central Heating throughout. 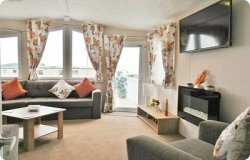 Lounge has living flame wall mounted fire and 42" wall mounted flat screen TV built in freeview and separate DVD player. 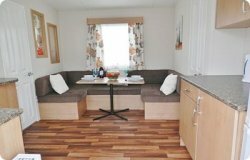 Lounge also benefits from separate living area and kitchen diner, fully fitted kitchen, full-sized fridge freezer , gas cooker, microwave, electric kettle, toaster, iron, cutlery dishes etc. 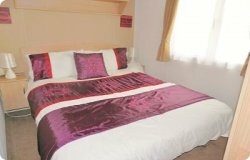 Master bedroom has double bed, 2 fitted wardrobes and dressing mirror. 2nd / 3rd bedrooms have twin beds wardrobe and overhead storage. 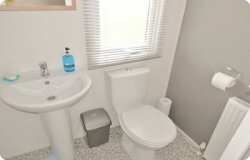 Family bathroom with good size walk-in shower, wc and hand basin. Fire extinguisher and smoke alarm are also provided for your safety. Location: 5 Minute walk to complex.